What were the Albatross Crime Club and the Albatross Mystery Club? Were they really clubs in any meaningful sense of the word? The branding clearly came from the Collins Crime Club in the UK, which was not a traditional book club, but more of a mailing list. Occasional newsletters were sent out to anyone who registered an interest, although so far as I know there was no fee to join. In modern terms, it was more of a Facebook Group than a real club. 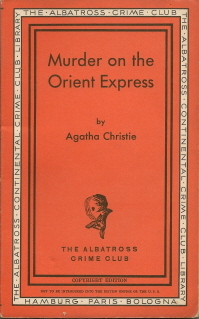 The Albatross Crime Club not only took its name and logo from the Collins Crime Club, but almost all of its titles as well. 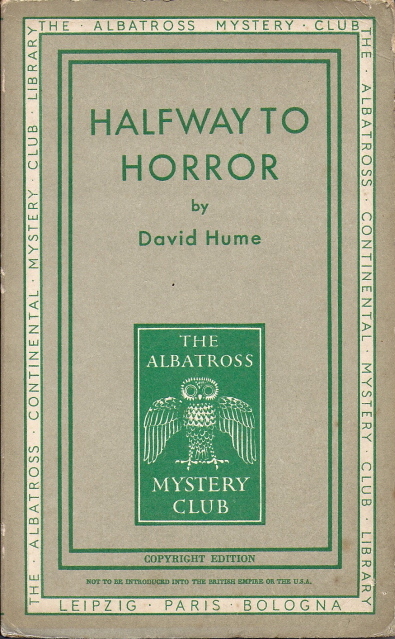 As far as I can see, all but one of the books had already been published in the Collins Crime Club before appearing in Albatross, although it may be that in rare cases the Albatross edition had precedence. 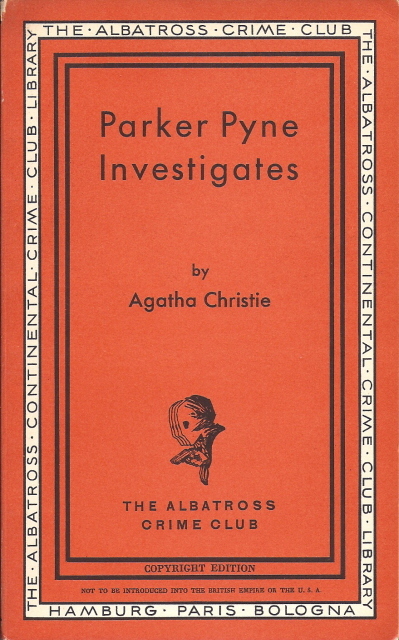 The one exception seems to have been Agatha Christie’s ‘Parker Pyne investigates’, which for some odd reason was initially published as a Collins Mystery rather than in the Crime Club series, although it did eventually get there many years later. That still means that all the books came via Collins. That seems to have been a qualification for entry to the series, as a small number of crime novels from other publishers continued to be published in the main Albatross series, even after the launch of the Crime Club. 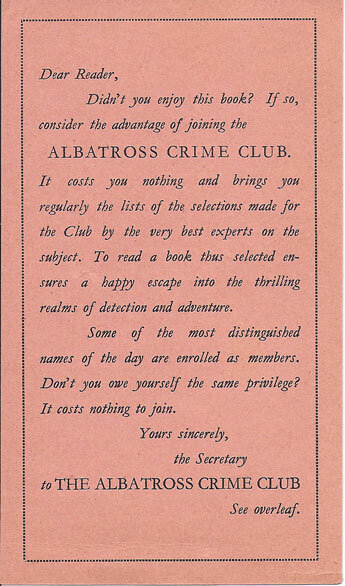 So it looks as if the Albatross Crime Club was effectively the continental arm of the Collins Crime Club, and was similar in being essentially just a mailing list. 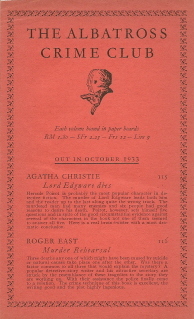 Readers were invited to join the Club by returning a small card inserted in the books. It cost nothing to join, but members were promised regular lists of the selections made for the Club. The only evidence I've seen to confirm that anything was ever provided to members is a leaflet from late 1933 listing the Crime Club books. It may be that copies of this were sent out to the mailing list as well as being inserted into new volumes. 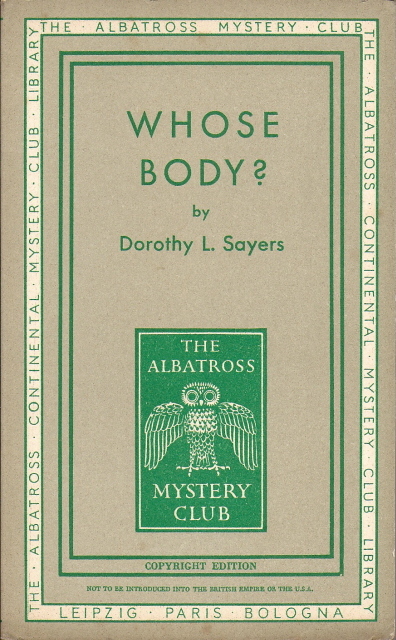 The Albatross Mystery Club is more of a puzzle, as there was no equivalent branding on the Collins Mystery books in the UK. Albatross seem to have created a new name and a new logo to go alongside the Crime Club, although again it seems that books were only given the Mystery Club branding if they were published by Collins in the UK. 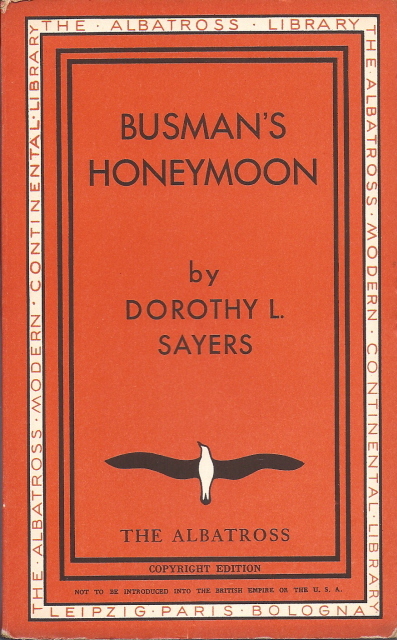 So for instance Albatross published three crime books by Dorothy L Sayers in the main series (i.e. not Crime Club) but then two others in the Mystery Club series, and the only distinction seems to be that Collins had acquired reprint rights in the UK for the latter two. Whatever the thinking was behind the marketing of these series, it seems to have been successful. The Albatross Crime Club ran to over 100 titles in 6 and a bit years, and included quite a high proportion of the UK Crime Club titles over this period. There were a further 23 Mystery Club titles in the later period. Although some of the books from both series are now quite a bit harder to find than the main series Albatross titles, I suspect that’s because the survival rate of crime books is lower than that of literary fiction rather than because sales were lower.